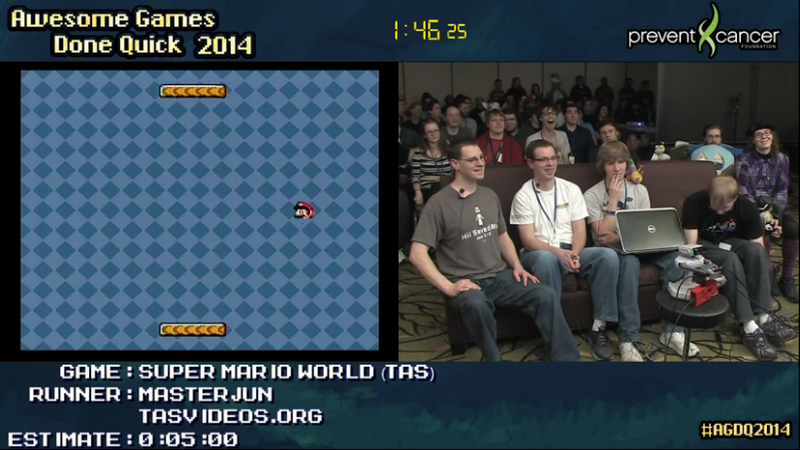 Every year, Speed Demos Archive puts on a marathon of video game speedruns for charity called Awesome Games Done Quick (AGDQ). Twice, actually; the other one is Summer Games Done Quick (SGDQ). 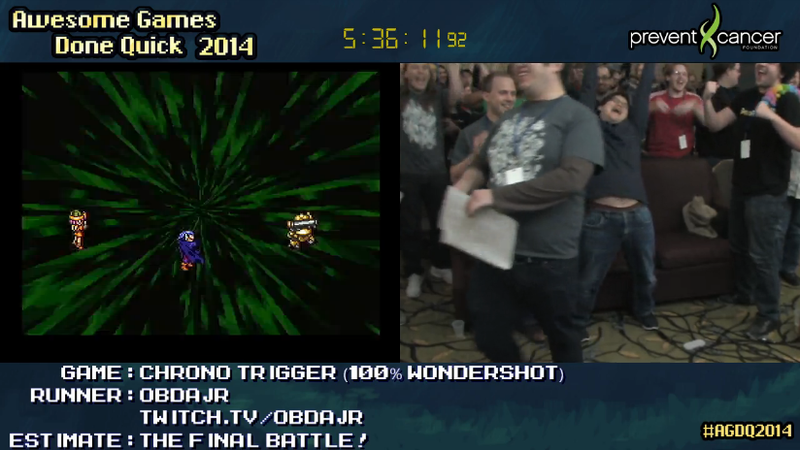 This year's AGDQ was the biggest yet and brought in over $1,000,000 in donations for the Prevent Cancer Foundation! It was a week long event (longer if you count the multiple days of bonus stream), so it'd be understandable if you couldn't be watching for so many days straight. Or perhaps you didn't know about it and missed it entirely. Well there's good news: helpful Redditors, blazingkin and suudo have compiled lists of all the runs during the marathon with links to the VODs on Twitch. 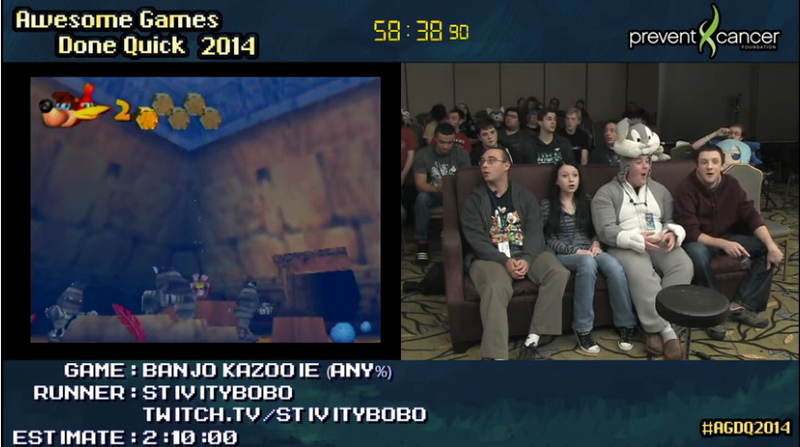 Still, that's over a week straight of speedruns to watch, so I compiled some of my favorite moments from AGDQ 2014. If you have to choose, these are the ones to watch! This was a little different from the rest of AGDQ because rather than a person speedrunning a game, the speedruns were done via impossibly optimized and fast prerecorded inputs. These Tool Assisted Speedruns (TAS) are done frame by frame and show off tricks that would be impossible for a human to physically do, but are still possible in theory. In this case, the TAS exploited a glitch in Super Mario World to corrupt the memory and actually program Pong and Snake from within the game and make them playable. It's ridiculous and unless you're an expert in Super Mario World and computer programming, you'll probably have no idea what's going on. Chances are, that'll just make it all the more fun to watch. For more of the same kind of thing, check out this total control hack of Pokemon. I don't know about you, but I'm definitely a fan of game music. That's why I was super hyped when during Stivitybobo's speedrun of Banjo-Kazooie, the composer of the game's soundtrack, Grant Kirkhope, started posting in the chat. But it got better! 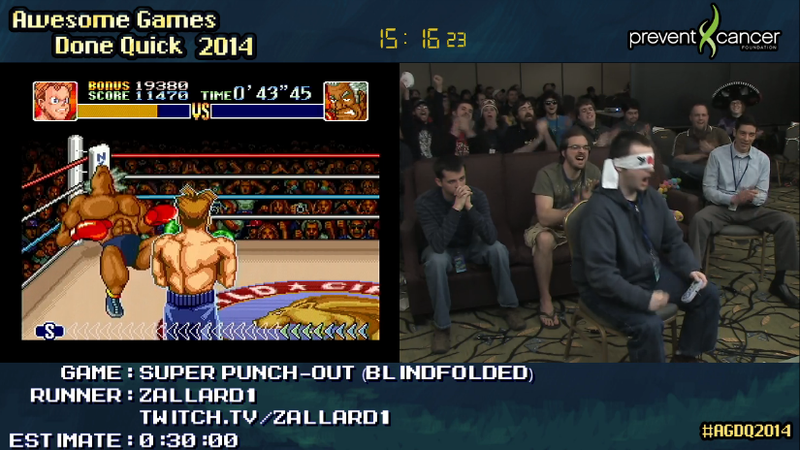 Several minutes later, the guys managing AGDQ contacted him on Twitter and set up a surprise Skype call with him. Not only did he sound like a totally cool guy, but he also dropped some knowledge bombs about the early development of the game, the progression of the soundtrack, and the origin of Mumbo's "eekum bokum". Fans of Banjo-Kazooie and game music will definitely want to check this one out. Punch-Out!! might not be as popular as other Nintendo franchises, but it's no less of a good game. What looks like a fighting game plays more like a puzzle game with an emphasis on timing and quick reactions as you figure out how to damage each opponent. Also, it's really hard. That's why it's really impressive that Zallard1 was able to beat it blindfolded by relying on the game's audio cues, often predicting exactly how much time he had remaining at the end of fights. Fans of this kind of challenge might also be interested in Sinister1's blindfolded run of the original Punch-Out!! and Peaches__'s one-handed run of Super Mario 64. If game music composers like Grant Kirkhope aren't your cup of tea, perhaps you'd be interested in hearing from a game programmer. If so, you're in luck, because one of the programmers of Metroid Prime, David "Zoid" Kirsch, joined in for the speedrun of Metroid Prime on Skype. This was one of the guys responsible for scripting the game's many puzzles and other interactable elements like doors and whatnot. So not only do you get to watch a really cool speedrun with sequence breaks out the wazoo, you can also hear some interesting details about how the game works. Like, you know how the next rooms load when you shoot the doors in Metroid Prime? Well it turns out that there are actually invisible triggers before you even get to the doors which predict where you'll be going next and start loading the next room even before you get to the door. Pretty clever, I'd say. Forgive me for giving Nintendo games and Metroid in particular such a large portion of these highlights, but this four-way race of Super Metroid was one for the ages. 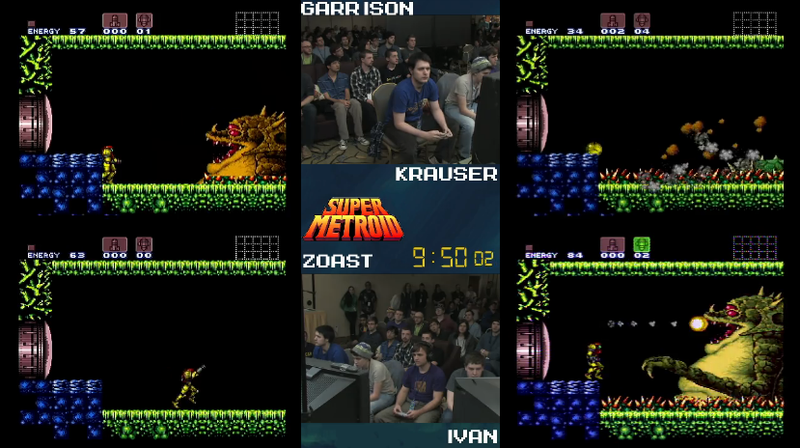 Not only is Super Metroid one of the most impressive, fast paced, and technical speed runs to watch, this matchup pit four of the best players against each other in one of the best races I've ever seen. There were amazing comebacks, there were simultaneous boss kills, and I don't want to spoil it, but the ending was so close that you won't want to miss it. You've gotta check this one out. After a week straight of games and several surpassed donation goals, the final goal of one million dollars was set. It seemed unachievable. But against all odds, the community and people around the globe pulled together during the final hours of the final run (Chrono Trigger) and managed to surpass the lofty goal to the cheers of many. It turns out video games can be used for good after all. 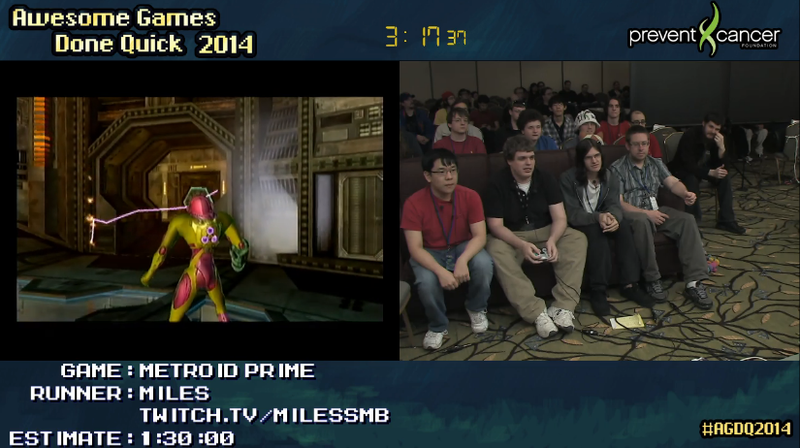 Even I couldn't watch all there was to see during AGDQ 2014, so there are plenty of highlights beyond these. Be sure to check out the Reddit thread and share your favorite moments in the comments. See also: SGDQ 2013!